How do you know if you need to use a clay bar? 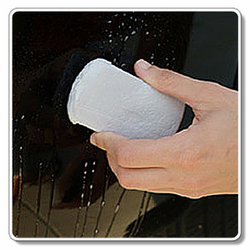 After thoroughly hand washing your car, feel the surface of your car's paint. Do you feel bumps and rough spots? These bumps are contaminants attacking the finish of your car. Removing these surface contaminants (road tar, acid rain spots, bug residue, paint over-spray, brake pad dust, hard water spots, etc.) will improve both the look and health of your car's paint. By the way, you can magnify your sense of touch by inserting your fingertips into a sandwich bag or a piece of cellophane. No matter how well you hand-wash your car, many of the contaminants that have worked their way into your car's paint finish will remain. Have you ever looked at your foam wax applicator pad after applying a coat of wax? What do you think that black stuff is? It's dirt, and you're waxing over it, sealing it in. Detailing clay isn't new. Paint and body shops have been using it for years to remove paint overspray. Clay is fairly new to the car detailing market, and is very new to the consumer on retail shelves. New technology detailing clay bars are made of fine polishing particles in a soft, malleable "clay" medium that allows the bar to be formed and kneaded. Some clay makers add color to make the bar more attractive or to identify bars of differing strength (coarseness). Many clay products claim to contain no abrasives. This is stretching the truth. The reason clay manufacturers claim their products don't contain an abrasive is because the general public thinks the word "abrasive" refers only too aggressive, paint removing materials. The fact is that the abrasives in most automotive clay products are so fine that you will not see any reduction in paint gloss. After several uses, paint luster may even improve. Still, I have heard some horror stories about people ruining a Ferrari paint job using a clay bar. I can see how this might be true if an inappropriate product was used or if the clay bar is used incorrectly. The critical component to safety is proper lubrication. Most detailing clay retailers recommend using their detailing spray as a lubricant. Detail sprays work as a clay lubricant because they contain chemicals that prevent scratching when wiping away dust and light dirt. The problem is that most detailing sprays also contain some form of alcohol. Used in heavy concentration (the surface must be thoroughly wet with lubricant), alcohol removes wax protection and causes most clay formulations to break down and get mushy. Once this happens, your clay is dead, and it will make a smeary mess. We also discovered that some car wash soaps will cause the same problem when the clay is allowed to sit in the bucket of soapy water. Many people assume that detailing clay replaces pre-wax cleaners. While it�s true that clay does the heavy lifting, it does not replace the need to use a pre-wax cleaner. Pre-wax cleaners are designed to remove old wax, embedded dirt and light stains from your paint. They also help to restore gloss and remove light surface imperfections. Pre-wax cleaners are a combination of light polishing material and cleaning solvents. Most of their cleaning ability is provided by the cleaning solvents, not the polish. The polish is so light that you would have to rub for hours to remove swirl marks. In fact, you could use pre-wax cleaners every month and not measurably reduce paint thickness. I recommend using a pre-wax cleaner after detailing clay and before waxing. If your paint is in excellent condition, a good pre-wax cleaner will keep it healthy so you can avoid having to use heavier polishes. Sonus Paintwork Cleanser and Pinnacle Paintwork Cleansing Lotion are two excellent pre-wax cleaners. Pre-wax cleaning deep-cleans the paint. The result is a rejuvenated top paint layer, which is then ready for waxing. There are any number of paint cleaners available. I classify them in two different categories: pure cleaners and cleaners with basic paint protection. Sonus Paintwork Cleanser is an example of a pre-wax cleaner that does not contain protection, whereas Klasse All-In-One cleans and contains wax protection. When cleaning or polishing paint, always work in a shaded area, out of direct sunlight. Polishes and cleaners do not work well on hot surfaces. Work on one area at a time, covering 2 to 4 square feet. Buff off the polish residues as you go. Most pre-wax cleaners do not need to dry or haze before being wiped off, but be sure to follow the manufacturer's instructions. You can use a foam, terry cloth or microfiber applicator pad to apply your pre-wax cleaner. If your paint finish is in new or like-new condition, I recommend a quality foam applicator. If your paint is moderately oxidized, I recommend a microfiber applicator. Use a small amount of pre-wax cleaner. With most pre-wax cleaners, a 1-inch-sized dab is enough to clean and polish an area of 2 to 3 square feet. If the polishing residue does not buff off easily, switch to a clean wipe towel. For best results, I recommend using a microfiber polishing towel. Great Microfiber Detailing Applicator for Car Wax or Polish! Foam Wax Applicator for Easy Hand Waxing!